After a long day of learning, kids come home from school looking for something to eat. Rather than letting them raid the pantry for any hidden cookies or chips, stock up on the good stuff. We’re talking fruits and veggies, of course, as well as some unexpected items your little ones will be delighted to help you make. You know kids need proper nutrition to maximize that brain power during the school day and well into all their after school activities — whether it’s sports, music lessons or playing outside with a group of friends. To help you out, we’ve put together some ideas that’ll help busy parents conquer the never-ending challenge of after-school snacking. Here are some easy after-school snacks kids are sure to gobble up just as fast as you can make them. Meanwhile, parents can take solace in knowing their little ones are eating right. Fruit and veggies, but better? We’re rethinking chips and dips and going with some healthier fare to keep brains growing even after the school day comes to a close. Now, you can use chips, but we recommend stocking up on carrots, celery, radishes, cucumbers and tomatoes — or whatever is in season or strikes your fancy. Offer these to the kids alongside the chips. They may surprise you by digging in. Parents, we’ve got this covered. 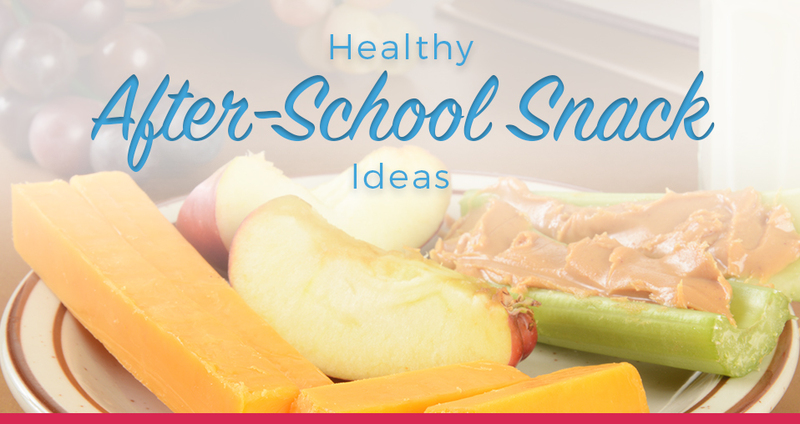 Here are a few after-school snack ideas you can pull out when your child craves a salt fix. If your kids like their guacamole with a little kick, this is the perfect recipe. Avocados provide healthy fats, ideal for brain development and, let’s be honest, a real treat for the taste buds. Making your own guacamole is a breeze. Here’s how you can whip the green stuff up in a few seconds, without breaking a sweat. Slice avocados and remove the pits. Scoop out the flesh and add to a medium-sized mixing bowl. Add lemon juice to the bowl, and roughly mix with avocados. Add the salt and mash until avocados are smooth. Your kids can do this part. Stir in the tomatoes, chipotle pepper, cilantro and onions. When the contents are evenly distributed, cover with plastic wrap and refrigerate until ready to serve. Serve with chips or veggies. Sure, you can always stock up on store-bought hummus, but if you’ve got a food processor on hand, it’s definitely worth making your own. There is nothing better than a fresh batch of hummus, after all, and believe us, the kids will gobble this stuff right up. They can help make it, too, because the recipe is incredibly simple. Serve with pita chips, veggies or spread on a sandwich — it’s super versatile. If you’re a real stickler about making a creamy, skin-free hummus, you may want to remove the chickpea skins before you begin. Otherwise, disregard this tidbit. In the base of your food processor, add chickpeas, tahini, olive oil, garlic and salt. Squeeze lemon straight into the bowl and pick out seeds, if needed. Puree the mixture until smooth. Transfer to a serving bowl or an airtight container, like the FridgeX collection. Hummus should keep for about a week in the fridge. Double the batch, and add to kids’ lunches if you’re on the hook for packing midday meals, too. While getting your kids to eat their hummus with veggies only is the ideal, it’s not always realistic. Skip the preservatives you’ll find in store-bought chips and make your pita chips in the oven. Kids will love cutting these into bite-size strips or triangles, perfect for scooping some homemade dip. As a bonus, this offers a great solution if you keep buying bread and failing to finish it before it goes stale. We’ve opted to go ahead and use a whole package of pitas, which is generally about 8-10, depending on the brand, so you can make a batch that’ll last throughout the school week. Planning ahead pays off, right? Preheat oven to 400 degrees. Line a large baking sheet with parchment paper. Use a pizza cutter to slice pitas into small triangles or strips, and place in a single layer on the baking sheet. In a small mixing bowl, add olive oil, minced garlic, oregano and basil and whisk together. Brush the olive oil mixture over the top of the pitas, then sprinkle with salt and pepper, if desired. Place the baking sheet in the oven and bake for about 6-8 minutes. The edges should be slightly browned when finished. Keep a close eye on the pitas, as they may burn easily if forgotten. Serve with hummus immediately, or store in an airtight container or large Ziploc bag. Making your own chips is much easier than one might think. For one, all you really need to do is season some sliced veggies and pop ‘em into the oven for a bit. We’ve opted to use mixed vegetables for a little variety, but feel free to use whatever you and your kids prefer. Preheat the oven to 400 degrees and coat two large baking sheets with non-stick cooking spray. Peel and thinly slice all vegetables, and place them in a large mixing bowl. Add olive oil, turmeric, garlic powder and salt, tossing together until all vegetables are coated with the mixture. Arrange in a single layer on the baking sheets, and place in the oven. Bake for about 25 minutes, turning halfway through. Reduce heat to 300 degrees, then bake for an additional 10 minutes. Remove from heat and cool before serving. Store in an airtight container, and serve with hummus, guacamole or as is. Chips should keep for about three days. These make perfect healthy afterschool snacks. Smoothies are easy to make and allow parents to rest assured knowing their little ones are taking in some much-needed fiber and vitamins. These soft, delicious fruits are great straight out of the freezer—resulting in something tasty that looks like ice cream. We’ve added blueberries, coconut water and a little bit of spinach for a well-rounded, nutrient-rich refresher. Trust us, your kids will be greens converts in no time. Place all ingredients into a food processor or blender, blending until smooth. Serve in a tall glass, and take a quick break before diving into that math homework. Strawberries, raspberries, and some protein-rich Greek yogurt? This kid-approved smoothie is the perfect sweet and healthy treat needed to soothe school-day troubles, and only takes a few seconds to whip up a tall glassful. Add all ingredients to a blender or food processor. Combine until smooth. Pour into a tall glass or a couple of smaller ones and serve — just like that. Snack bars and beyond — make these homemade snacks, and your kids will never ask you where the cookies are again. And you’ll find yourself with something tasty to munch on, too. Granola is another one of those things you can buy in a cereal box, but pulling it out of the oven is much more satisfying. Homemade granola is so easy to make, and whipping up a big batch gives you and your kids a snack that’ll last all week. Eat on its own or pair with fresh fruit and Greek yogurt. Or add it on top of one of the smoothie recipes we’ve included and make it into a satisfying smoothie bowl. Meanwhile, line a large baking sheet with parchment paper or coat thoroughly with non-stick cooking spray. In a large mixing bowl, add oats, nuts, seeds and dried fruit. Stir together. Next, pour in coconut oil, maple syrup, cinnamon, vanilla and coconut flakes. Mix well, stirring gently with a wooden spoon until all ingredients are completely coated in the mixture. Transfer the granola mixture to the pan, spreading evenly. Bake for 25 minutes, or until the mixture becomes a golden brown color. Stir once, halfway through. Once it reaches the desired color, remove the granola from heat and let cool. Store in an airtight container. The granola mix should last about a week or two. The best way to stop buying sugar-laden energy bars? Make them yourself. Easy to make and much cheaper than buying them at the market, these bars are beloved by kids and parents alike, and whipping them up is an activity kids will enjoy as much as baking cookies. Plus, they’ll keep kids fueled for the long afternoon and evening ahead — through sports games, homework and more. Preheat oven to 400 degrees and coat a large baking sheet with non-stick spray or butter. In a large mixing bowl, add bananas and mash until smooth. Then stir in almond butter, butter, eggs, honey, and cinnamon. Make things easy by using an electric mixer, and blend until wet ingredients are thoroughly mixed. Fold in almond flour and baking powder, and blend with the electric mixer on the highest setting until smooth. Stir in dried fruit and oats. Once blended, spread the mixture evenly on the baking sheet. Kids can help with this step. Place in the oven for about 15 minutes. The edges should be golden brown. Once the bars are done baking, remove from heat and let cool for about 15-20 minutes. Cut into small pieces and serve, or store for later. For something a little more savory, some oven-baked edamame hits all the right spots. A garlicky peanut sauce with a hint of honey crisps up ever-so-slightly in the oven, making this a delightful snack full of surprises. And, it’s easy enough for kids to make, too. Preheat the oven to 325 degrees. Lightly coat a large baking sheet with non-stick cooking spray. Meanwhile, in a small mixing bowl, add peanut butter, honey, sesame oil and garlic, whisking together until ingredients are thoroughly mixed. Then mix in edamame, gently stirring until all beans are covered with the mixture. Add edamame to the baking sheet, making sure beans are arranged in one single layer. Sprinkle salt and sesame seeds over the top, and place in the oven. Bake for about 30 minutes and remove from heat. Let cool for about 10 minutes. Once cool, beans should crisp right up. Serve immediately for best results. Store Those Treats with Ease – Shop Fridgex Today! Armed with new ideas for after-school snacks both healthy and delicious, you’ll be the hero of your house and the envy of all your kids’ friends. But we’ll admit, it can be hard to get motivated to make cool little snacks when your storage situation is less than ideal. Get organized before the new school year gets under way. Our line of Fridgex storage containers and serving platters will help you kick things up a notch, and maybe even motivate you to do some Sunday night snack prep before things get crazy. So, check out Fridgex, and consider this the Mom and Dad version of back to school shopping.